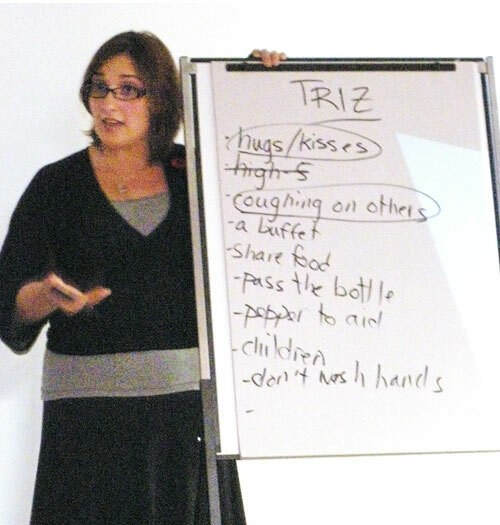 Erika is a coach with the Canadian Positive Deviance Project as well a long time facilitator who helps people bring about positive change in groups which have complex systems. On a personal note I would also like to say that she is naturally disarming and cheery which just may be one of the biggest advantages that she has in the field of PD. The husband and wife team of Jerry and Monique Sternin formalized what we consider PD is today. Jerry is described as the world’s leading expert in the application of PD and his wife Monique chairs the Positive Deviance Institute at Tufts University in Massachusetts. PD has only been in existence in an official capacity since the 1990’s. The Positive Deviance Initiative website states that, “PD is based on the observation that in every community there are certain individuals or groups whose uncommon behaviors and strategies enable them to find better solutions to problems than their peers, while having access to the same resources and facing similar or worse challenges.” But if anything, this is only a brief overview about what PD’s main belief is. PD allows people in large groups to have a bottom up approach to solving agreed upon issues. PD believes that the people that ‘touch’ the problem have the wisdom to solve it. This type of problem solving is used to discover positive actions (mostly considered the minutia) that had previously gone unnoticed. But these actions can be quantifiably measured for progress. PD allows new relationships to form that allow the participants to ‘act their way to a new way of thinking’. In fact, Erika said that if the facilitator/coach is too aggressive with their help that the process of PD can actually fall apart. The idea is to allow the people affected to change their destinies by discovering for themselves what is wrong with their present system and by replacing some of their problematic actions with new habits. 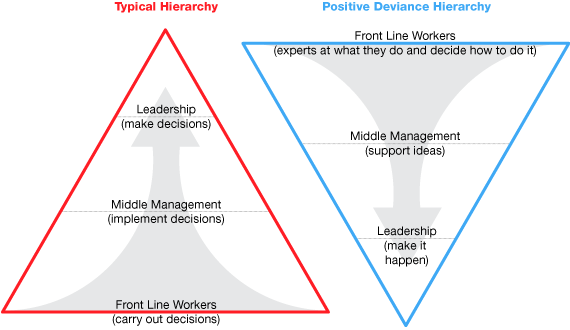 Whereas most traditional models have a team with a hierarchy of decision makers on top, PD allows for the flow of information to be decided on by the actual workers first and then the management or overseers are obliged to remove any barriers. At this point Erika stated that one of the most difficult parts of this process is to get the managers to say “yes”. What the coaches have found is that about 5% of people in any group do things differently to create positive outcomes and it is these people that are fighting the status quo to create a benefit. The PD process strengthens over time as the workers generate mass awareness and actively change their behaviours. Erika quoted several times that “Knowledge doesn’t change behaviour” and that therefore PD encourages changes in relationships. Defining the problem and understanding what the desired outcome will be. Simply put this tool is similar to applying a devil’s advocate like approach for problems. Most people understand very clearly how things work in their job and so usually they cannot offer a solution to a problem that exists because they can’t understand what they are doing wrong. But instead, if one tries to help define how a problem can grow (no matter how obvious or silly), a comprehensive list of actions can be made to detail the issues. When the list is complete, the facilitator then asks the group what they haven’t seen or experienced and crosses those items of the list. The one’s that remain are the issues that must be dealt with. We then started to cross out the ones that were not done. What was left (circled) for us was our personal recipe for passing on a cold virus for that evening. This entry was posted on 2010.11.11 at 4.14 pm and is filed under Organizational Thinking. You can follow any responses to this entry through the RSS 2.0 feed. You can leave a response, or trackback from your own site.